Eu disse chuva … Eu disse frio !!! I said rain… I said cold!!! No fim de semana, falei sobre os diferentes usos de cachecóis e lenços. Agora, hoje, falarei sobre o uso de botas! Que é pra ninguém ter desculpa de sair cometendo gafes por aí, certo? Over the weekend, I spoke about the different uses of scarves and handkerchiefs. Now, today, I will talk about how to wear boots! I don’t want anybody having excuses to go out there committing gaffes, right? A vantagem dessas botas é que combinam tanto nos dias mais frios, quando os mais amenos. 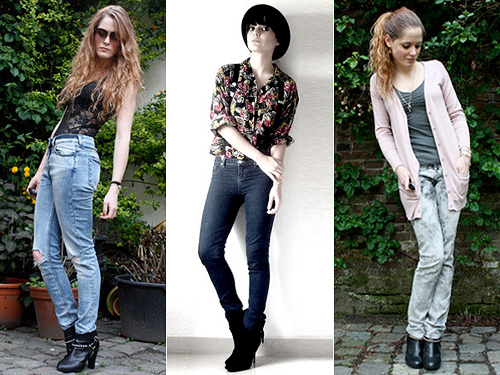 Elas combinam com saias mais curtas ou shorts com meia grossa, calça skinny, leggings e vestidos! The benefit of these boots is that they match both in colder and warm days. They match with shorter skirts or shorts with thick socks, skinny jeans, leggings and dresses! Fique atenta ao montar o look com essa bota! Mulheres mais altas podem abusar! Mas as mais baixinhas precisam tomar muito cuidado para não cortar a silhueta… Por isso, esse estilo de bota deve sempre estar por baixo das roupas, usando peças que escondam a bota. Be careful when creating the look with this boot! Taller women can abuse! But the shorter girls must take great care to do not cut the silhouette … So, this type of boot should always be under the clothes, using pieces that hide the boot. A bota de cano longo é a mais prática! 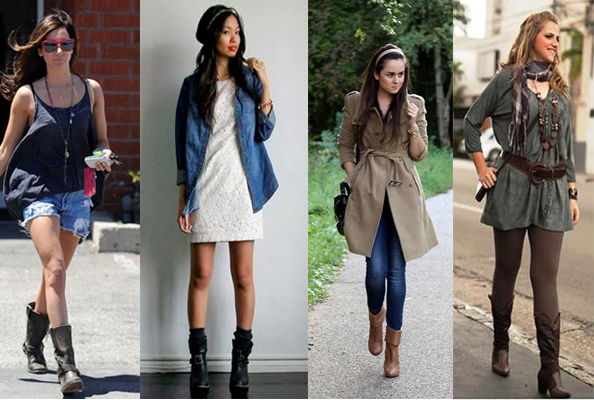 Pode ser usada por todo mundo e combina principalmente com leggings, shorts, skinny jeans e vestidos! Essa bota é capaz de “quebrar” o romantismo dos looks. The high boots are the most practical! They can be worn by everyone and specially with leggings, shorts, skinny jeans and dresses suits! This boot is able to “break” the romanticism of looks. São as botas que o senso comum diz serem as mais sexys! Eu não tenho, particularmente, coragem de usá-las. Mas podem ser usadas com saias curtas, sobretudos e vestidos. Ou ainda com leggings! Are the boots that common sense says are the sexiest! I particularly don’t have the courage to wear them. But they can be worn with short skirts, coats and dresses. Or with leggings! São perfeitas para o clima de chuva e frio! Podem ser usadas com saias, vestidos e calças! Eu não tenho a minha… Mas acho super meigo e usaria com certeza!They are perfect for the rainny and cold weather! They can be worn with skirts, dresses and pants! I don’t have them … But I think they’re super sweet and I would wear them for sure! Se você tem panturrilhas mais grossas, procure usar meia calça na mesma cor da bota! Assim, tudo vira um “bloco” só e deixa o look mais harmonioso. If you have thicker calves, try wearing pantyhose in the same color of the boots! So everything becomes a “block” and create a most harmonious look. Alguns modelos podem ser considerados sociais, mas as botas, por definição, são um calçado informal. Por isso, não use botas na hora de montar um look para eventos como casamentos ou festas de traje fino. 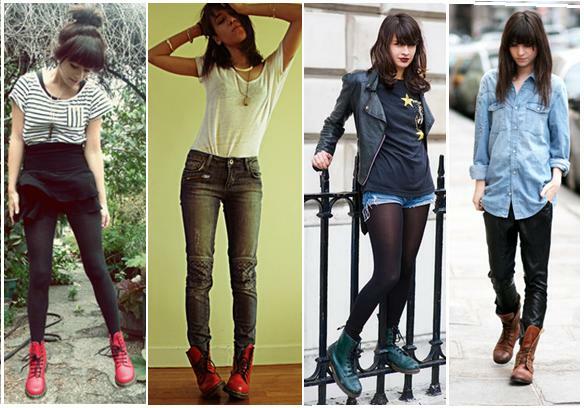 Some models can be considered social, but the boots, by definition, are an informal footwear. Therefore, do not use boots when creating a look for events like weddings or parties with fancy costume. É isso aí! Qual estilos você gosta mais?? That’s it! What styles do you like most ? ?